The critical first step in exporting quality, safe hay begins at the field. Planting rotated crops ensures the soil maintains the necessary nutrients to produce healthy crops. The second step is ideal growing conditions based on temperatures and moisture. 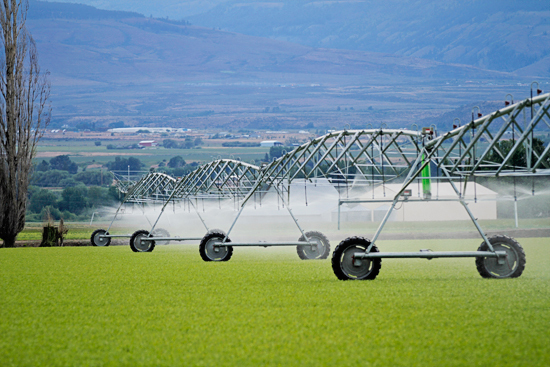 These factors impact planting, irrigation, and harvesting; thus controlling the number of cuttings per year. At Calaway Trading, we understand the importance of sourcing quality crops for our customers worldwide. 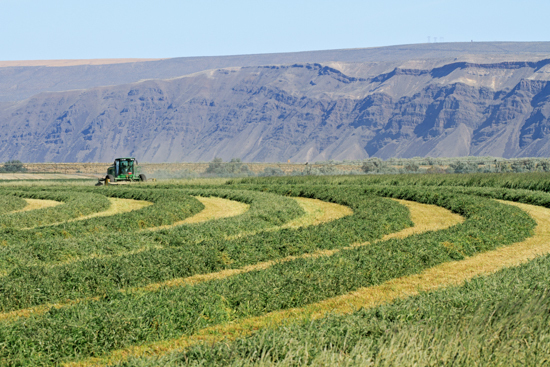 Harvest entails a multi-step process: swathing; raking or "curing"; fluff; and baling. A team of harvesting equipment cuts tall grass and legumes at the correct stage of maturity which is then allowed to dry by the sun before being gathered into windrows. The cured hay is baled either in 3-tie, 3x4 or 4x4 big bales depending on available equipment. The forage must be completely dried before baling and stacked in dry storage. If the hay is baled while moisture levels are >12% or it gets damp at some point in storage, there is an increased threat of spontaneous combustion. Finished units are transported either to an onsite stack pad where it is fully tarped or an assigned storage facility to protect from future moisture and spoilage. Stored hay is stacked in such a way to lessen moisture contact with the soil. Forage stored in the field is transported to a processing facility as needed to complete bookings. Loads are tarped dependent on weather to ensure the product remains dry.